Today’s marches were special. I joined the Shubra march which was the biggest march I’ve ever been to. I could not see the beginning or the end of it. Surpassing January 28th? Perhaps, but that’s not the main issue. It has been ages since the protests have been that unified. We all denounce the constitutional declaration set forth by Morsi which gives him dictatorial powers over the nation. We will not agree what should happen next but we’re in agreement on what shouldn’t happen next. The constitutional declaration is an insult to people’s intelligence. Morsi underestimated how people may forgive for a while but not forget. They were not swayed by retrials of former regime members, we’ve lived through two years of that and it was not fruitful. They were not swayed by promise to help martyrs’ families, the police were creating new ones with their brutality as he spoke those words. This is the first time we’ve had mass marches in the evening. The square was full on a work day and people went to march right after work on a Tuesday. This is the first time we’ve welcomed some of the former regime supporters. Having former regime supporters seemed like a cop-out to some, but it’s truly a triumph for the revolution. The former regime supporters, referred to as felool, have chosen the one way of protest they’ve most criticized. We organized the protests. We chant in the protests, we chant against Mubarak’s regime, we chant against the police thugs and we chant against Mohamed Morsi. This is our revolution; the same demands for a different tyrant. Supporters of the former regime are called felool but that is not an accurate description. They are felool supporters because they support the symbols of the old regime. The fact of the matter is that those who support injustices have been called felool and so by that rationale, Morsi supporters are the new felool. We have called on justice for all Egyptians, the former regime supporters are part of the nation. We must lead with our ideals as we have always done. We must draw them nearer to us. They must understand that we do not deserve to be tortured in police stations, or killed during protests. They must understand that our way of protesting and clinging on to calls for justice is what they must embrace. Their beloved army and police won’t help them with this. They need to learn how to stand up together with us for what’s right. Our numbers are great now and it’s no sin to change your mind. They have changed theirs. Even the bystanders on the sides of the street using their cell phones to record our protests, they are supporting us now instead of cursing us like they used to. Things are turning around a little, we are uniting. The Brotherhood is lying frantically trying to spin things around, but we are not fooled. Protesters were overjoyed at finding one another, finding that many people who share their rejection or a fascist state. Morsi’s attempts at destroying the revolution are not without resistance. The revolutionary demands have been bread, freedom and social justice. Prices are soaring, freedom is being constrained by the constitution being written and by his dictatorial power grab and at the same time social justice cannot be achieved with neo liberal policies that mirror his predecessor. The IMF loan conditions will not benefit the poor. The revolution called for democracy and power sharing. How can dictatorship be interpreted as democracy even if it is just temporary? Part of the reason we protested against Mubarak was because of having too much power. Those supporting Morsi are the new felool .They are supporting the making of tyrant. Ikhwan members have no opinion of their own, they're brought up in a culture of blind obedience. They went out to support Morsi's decisions before they even knew what they were. We on the other hand are free. A good portion of those protesting Morsi today gave him their votes and were willing to give him a chance provided he fulfilled his promises. He broke all of his promises and has shown no willingness to share power. He hasn’t even considered backing down despite the overwhelming objections to his decrees. 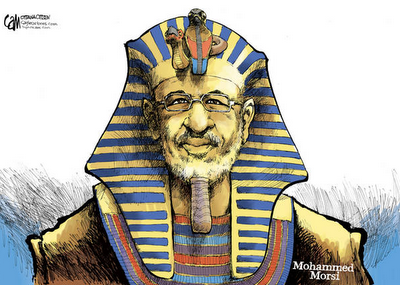 Morsi is controlled by the Muslim Brotherhood who takes all the decisions for him, with al-Shater's leadership. We don't have an independent president who can take a decision as to what's best for his people. He has called on the Brotherhood to support his decisions because he could not trust people to support such a dictatorial power grab. We will continue to protest tyranny and dictatorship. We cannot trust the intentions or those unwilling to listen or compromise. A man who is willing to declare himself a temporary dictator will be willing to declare himself a permanent one. This is a strong drive from the police and once again they engage in brutality. I was present at the time on Sheikh Rihan, perpendicular to Kasr Al Ainy where the main attack took place. They fired a few tear gas canisters down that road in the direction of the church where a makeshift hospital has been set up. The problem is that brutality has been so ingrained within police mentality and there is nothing being done to address this. We do not know why police charged. They persist to be brutal and that is the manner in which Morsi wants them to remain. More and more evidence that the replacement of the general prosecutor was not reform but a move to help eliminate enemies of the state, Morsi's state or to be more accurate, the Muslim Brotherhood. Egypt Independent reports on photo journalist being brutalized by police. Morsi's decrees are not confusing at all. It's a power grab and any suggestion they’re to fix corruption is ill informed. Here's why. With all these powers, Morsi could have stopped police brutality on Mohmamed Mahmoud instantly and yet continues to push the rhetoric that the protesters there are hired thugs. Even if he believed that to be true, police needs reform and that is the one thing everyone is certain of. The absence of police reform indicates taking over the police in its current form which serves corrupt political leadership irrespective of the law. The same holds true for judiciary reform, because even with the general prosecutor changed, it does not guarantee that judiciary will be fair or independent. Many of the verdicts will continue to be politically driven but more likely to benefit the current regime. Bear in mind that the new public prosecutor is related to Ahmed Mekky, the minister of justice who has already shown bias towards the Brotherhood’s plans of maintaining the status quo. The general prosecutor himself being hired by the president will be loyal to the president, and if he is not, he can face charges as soon as the president replaces him. Removing the corrupt Abdel Meguid Mahmoud removed a corrupt man and entrenched a corrupt system. Reality is that the fixing corruption is an excuse for those who do not want to believe that Morsi granting himself absolute powers is the first step of a complete takeover of the state. 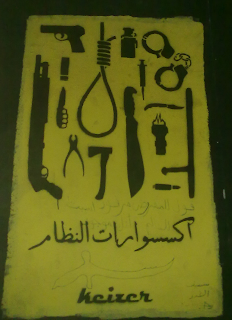 The most evident sign will be never putting Tantawi or Anan on real trial. Two days ago, protesters took to the street commemorating the anniversary of the 2011 Mohamed Mahmoud Clashes, one of the bloodiest confrontations with the police in Egypt’s transitional phase, leaving over 50 dead. Today, Mohamed Mahmoud Street looks almost the same as it did exactly one year ago, with similar altercations taking place. 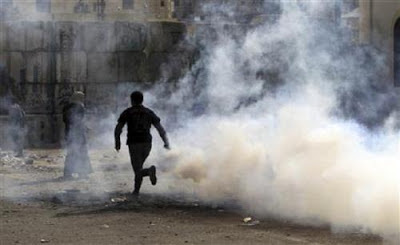 Protesters are clashing again with police in downtown Cairo due to a long history of injustice. The police are thugs in uniform and nothing has been done to reform the police, despite claims to the contrary. The Central Security Forces (CSF) uniform is associated with criminal activities. At the same time, the president and the prime minister are sending clear messages to the police, the military and to us that those in uniform can act with impunity and they won't be brought to justice. This is a monumental confession from those responsible for upholding the law, and that's why it makes no bit of difference if we wait for parliament, the constitution or Godot, because those who are supposed to uphold the law have promised criminals they won't be brought to justice. At a time when injustice prevails, everything turns upside down. Islamists who once sounded like revolutionaries sound like feloul1 today, and feloul who were once reactionary sound like revolutionaries. Not only do Islamists sound like Hosni Mubarak’s National Democratic Party (NDP), they say the exact same things with the exact same reasoning. Other than not being sympathetic to victims of needless police violence, one need only look at a map of downtown Cairo to understand that the clashes are not in the vicinity of the Ministry of Interior. But it is pointless explaining because that’s exactly what we told Mubarak’s supporters when they accused protesters of trying to storm the Ministry of Interior. Others argue what is the point? What is there to be achieved from these clashes? There are no clear demands. Simply put, the clashes are a response to injustice and a way for people to deal with loss. That aside, the argument fails on another level. 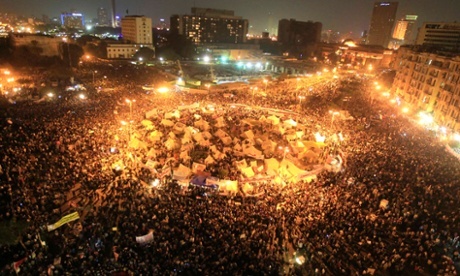 There was little point in reaching Tahrir on 25 January other than exercising our freedom. There was little point in taking down the police on 28 January other than protesting their brutality. People have expressed their sentiments without particular goals. That Mubarak stepped down is all well and good, but it wasn’t a result of planning, strategy or clear demands. The revolution never found justice and never found leadership. The arm chair pundits criticizing the clashes and people’s reactions don’t have a plan, not one that people want to follow anyway. Clashes with the police must always be put into context. The Egyptian army killed Egyptians and betrayed their pledge to protect them and the constitution. The police betrayed their oath to uphold the law. Even with their uniforms, the police can be considered a criminal organization because they do not adhere to the rule of law. There is an argument that not all cops have broken the law and so they can’t all be held accountable for the mistakes of their fellow officers, but it is senseless because they have not done their duty of bringing their criminal colleagues to justice. The same goes for the army. Those who have done nothing to prevent their fellow officers from killing Egyptians also broke their pledge. The argument of innocence does not hold particularly for the police and the army. Understanding that the police and the army are complicit either through direct criminal offenses or inaction and dereliction of duties, the clashes make sense. In light of clear message by officials that they have no intention to reform the security sector, but rather are calling for a return to draconian laws, protesters are vindicated when they conclude that an attack on them is justified. Perhaps that sounds extreme. Perhaps what I’ve witnessed of injustices has lead me to this conclusion, but if you examine the situation closely without the dogmatic notions about the police and government, you’ll realize that we’re in a situation akin to occupation. The police falls far off the mark from what it should be and so does the government. Our situation is extreme, not this conclusion. We are treated as expendable because we are not in uniform, because we don’t possess the guns, because we cannot give orders to those with the uniforms and the guns. Is it at all logical to respect lawless tyrants just because they are in uniform? Just because an oppressive government tells you to? To me it isn’t logical and yet people do it every day. Some are unable to accept that the world is a jungle and that they’re imprisoned. Some are unable to accept they’re worth nothing to their rulers. Some are unable to accept that those they support would allow this to happen. The most important fact in all of this is that injustice prevails. Uniformed men are constantly promised impunity. We’ve seen reconciliations with thieves, while revolutionaries thrown in prison. We’ve seen friends fall and die, and their murderers promoted. We’ve seen the dead called thugs by opportunistic political forces as they honor the military commanders who ordered the massacres. I cannot blame someone who lost a friend, a brother, a father, for going up against them. I cannot blame someone who is moved by these injustices. We’ve been patient long enough to know that justice in Egypt does not come through the courts or judiciary. We still don’t know what it takes to bring about justice and that’s why protesters clash, and that’s why they’ll continue to clash. On the way home late at at night, we saw a man being brutally beaten, tortured and humiliated in plain view by another. This was one night ago late Friday night or the early hours of Saturday. It was on Tahrir street, right next to the Misr petrol station off Galaa square. It was right near the Sheraton and opposite Faisal Islamic Bank. I was walking home with my friends from Zamalek to my house when we saw a man, his hands disproportionately larger than his body, with a knife in his hand corner another man against a wall and pound on him with the back of the knife, beat him and humiliate him. The scene was surreal, in the middle of a main street, right next to a busy gas station late at night, in plain view of the bank guards opposite the street. We left back to the street and saw that the scene hadn’t changed. No police car had passed by, and people around the fighting men were sitting idly. I called 122, the police, knowing full well they would do nothing. I told them I had been to the house of the ex minister of interior and they told me they’d do nothing, and I told him I know them on the phone I knew they wouldn’t send anyone out but I reported the situation. He asked for my name and asked if this was my number, and I said yes. We waited and watched and filmed a little and then I decided that the police station was just a minute’s walk away and that it would be better to tell someone than not at all. “Do you mean the two scruffy looking guys?” one of them said. “You should go in take a left and then go down the stairs,” he said. “What for? I know that no one will do anything about it,” I responded. I turned away frustrated and walked back to the main street. Still that man was beating the other, doing some kicks and pretty much humiliating him. Just as I was about to forget about it, I thought I’d do all I can do and go in and report it inside the police station as advised. I walked in and found the young men in their white shiny uniforms. I said that I had reported this before and I explained the situation. They wanted to send me off but then decided that someone was already on their way. Shami, Tariq and I were surprised by the answer. But was I really? People meant nothing to them. We laughed for a few seconds and then realized how sad it was he was right. I was sickened, but I realized I wasn’t sickened by that one man beating down on the other. I was sickened by the other thugs in uniform who beat down on those that opposed the ruling gang but would not move to save an ordinary citizen’s life. We should have got rid of all those police thugs when we had the chance. She taught me to love the moon. Every time I look up to the sky and admire its beauty I think of her. But how can I enjoy such beauty on my own? The moon was beautiful because of her. I urge myself not to contact her in attempts to share the beauty. What good will it do to try and share it with her if she doesn't want to anymore. No, I cannot share this happiness and beauty and in a way it ceases to be happiness and beauty. The beautiful sky outside the city with beautiful formations in the morning clears up at night to paint the night sky with stars. I look up and see the moon shining upon the water and sand, I see each star and feel I’m in a painting. I want her to be here, but that’s not possible and even if she were here, she wouldn't be. If only you could be here for this beauty, but would you find it beautiful too with me now? She has decided to share the beauty with someone else. I will not be the one she wants to point this too as she smiles and sighs. I open my eyes wider to observe the scene around me. The simple huts and the hammocks around, all immersed in a dark blue color that I have not seen in any painting or photo. I want to capture it but I know others have tried and the paintings and photos do not do it justice. The sea and the sky melt into one dark blue color as soon as the distant land and ships disappear. I cannot capture this image with its deep colors flooding my eyes and that’s why I open them wide, to take the moment in, knowing it is fleeting, just like my time with her. On many nights I did not take it in, and that is what I regret, but I’m grateful that before it was over I enjoyed the moments and took them all in, knowing that they cannot be captured, only remembered. 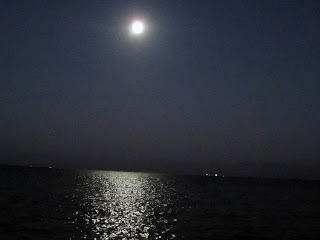 The moon’s reflection on the surface of the water captivates me. This giant beacon of light overshadowing all other lights changes the color of the water making it look like a pathway to a magical land. The scene looks like a movie set. No. Better than a movie set, all the magic without anything false about it. The water looks as though one could walk on it. She is the moon reflected on the surface of the water, but the part of the water upon which the moon’s rays are reflected shift depending on where you’re standing on the shore. Still I cannot but look at nature and think of her. The beauty around me seems incomplete. But that person I want to share it with is not there anymore. There was something real about the whole thing, but it’s not there anymore. Just like a shooting star in the sky, momentary and passing yet beautiful for the brief seconds it may last. There’s no point running to where the shooting star fell or looking for it. It was just like the waves. She was the sea and our time together was like the waves that hit the shore to form a splendid sound, but then the waves were there no more even though the sea remained. She is still there but our waves are not, and I look upon my sea and remember my waves. The sea still moves me because for a brief moment the waves were mine. Sometimes I want to send these thoughts and more to my waves, the moon’s reflection on the water, but I keep them to myself. I would be sending them to a place worse than nowhere. I would be sending them out to the sea, but they would never find her. It is a sea that I thought was mine but never really was. The waves are gone and yet every time I look upon the sea I long for them. I must move on and come to terms that there will be no more waves for me, no more waves for me. She taught me to love the moon; that I cannot unlearn. I have lost the waves, the shooting stars and even the sea, but I’ll always have the moon. Sometimes I long for her and sometimes I see her before my eyes but she’s not truly there. 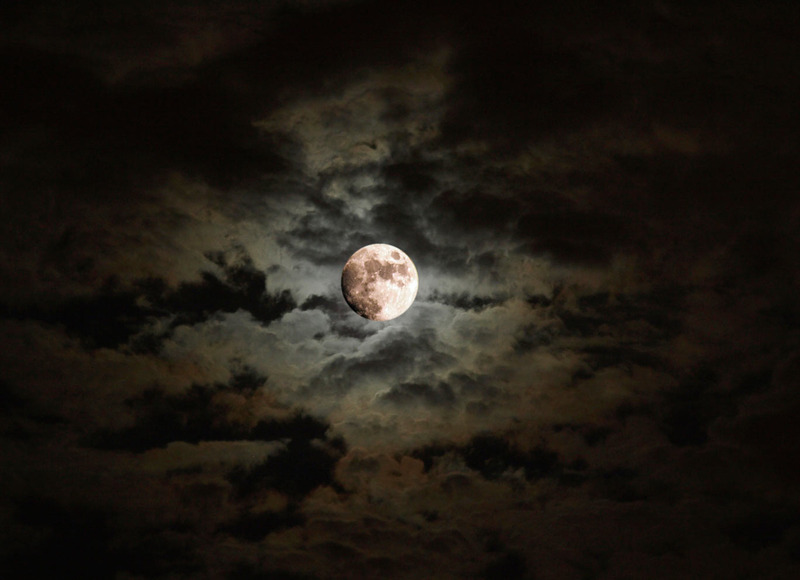 I close my eyes then search for the moon. I am comforted when I look upon it for that is the love I have left. But difficult are the days when the moon does not shine across the skies.